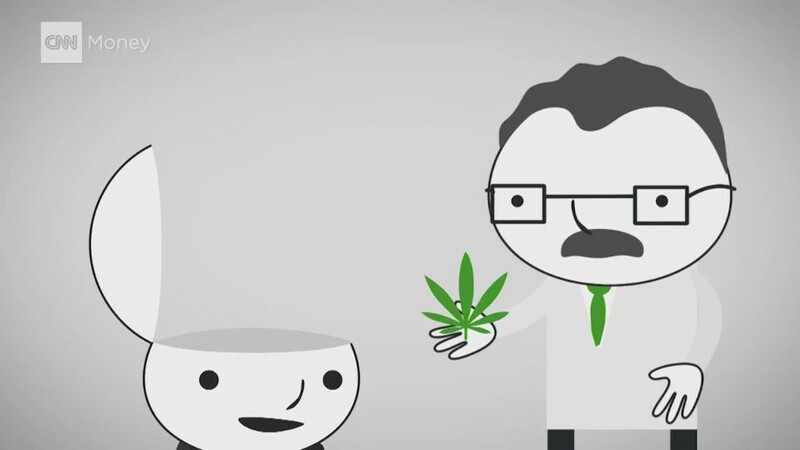 What's worse -- pot or booze? 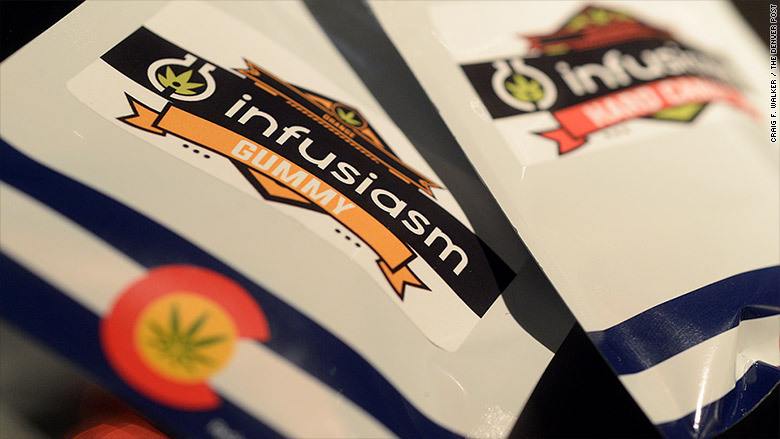 Colorado officials are planning to revamp the labels on edible marijuana so kids won't think it's candy. They want to get rid of the word "candy" from the packaging and they want to put a stop sign on it. This doesn't mean that marijuana candy is going away. Tommy Moore, spokesman for the Marijuana Enforcement and Taxation division for the state's Department of Revenue, said pot dispensaries "will still be allowed to sell marijuana infused chocolate bars and other candies." State officials are mulling over a symbol to put on the packaging to let consumers know that it contains marijuana. 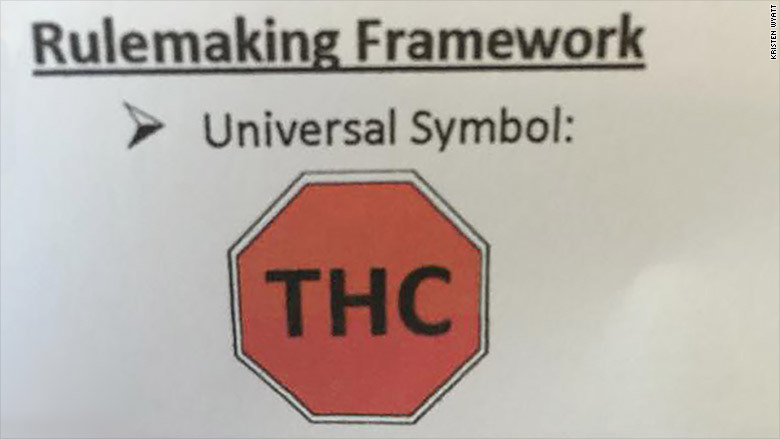 Moore said the Revenue Department has proposed a "universal symbol in an octagon shape with the letters THC" in order to "help prevent the unintentional ingestion of marijuana edibles." Colorado officials proposed a THC stop sign for cannabis candy, according to this Twittter image from AP Kristen Wyatt. The symbol looks like a stop sign, according to a Twitter image from AP reporter Kristen Wyatt. Moore said the proposed rules would also "prohibit the production and sale of edible products that resemble trademarked or otherwise commonly familiar commercial food products." In other words, there wouldn't be any more deliberate misspellings of real candy brands like Hershey's and Mars. Adam Orens, an economist with the Marijuana Policy Group who worked on the proposals, said they're intended to "fill some gaps in marijuana law." Orens, who co-authored a state study on marijuana portion sizes, said the legalization that went into effect at the beginning of 2014 is still being refined. For example, he said the active ingredients in individual candy bars were capped earlier this year at 100 milligrams of THC. They're divided into 10 portions of 10 mg each. This is to keep people from consuming too much of the powerful drug at one time. The public is invited to comment on the proposals at the state capitol on Aug. 31 and Sept. 1. After that, the State Licensing Authority will either adopt the rules as proposed, modify the rules and then adopt them, or reject the rules and send them back to the Marijuana Enforcement division for more work. Colorado officials want to ban the word "candy" from marijuana packaging, even when the product it contains is candy.